According to media reports in Italy, Everton have moved ahead of local rivals Liverpool in the chase for the talented midfield player Jorginho. The Brazilian born, Italian u21 international currently plays for recently promoted Hellas Verona and is highly regarded in Italian football. Liverpool turned their attentions towards Jorginho, full name Jorge Luiz Frello Filho, after losing out in the chase for former Shakhtar Donetsk midfielder Henrikh Mkhitaryan with the Armenian international choosing to join Borussia Dortmund in a £20 million deal. Brendon Rodgers is reported to have made a move for Jorginho, making an opening offer of £7.5 million, with Everton supposedly usurping that bid by a further £1 million. Everton are in the market for a midfield player and the exciting young and gifted Jorginho would certainly fit well with Roberto Martinez’ footballing philosophy, however it remains uncertain as to whether Everton could afford to pay such a significant transfer fee without first selling Marouane Fellaini. Jorginho is not a prolific goal scorer, with just a handful of goal (4) in 73 appearances for the one time Champions of Italian Football. Hellas Verona has endured a difficult time in the last decade and dropped down to the third tier of Italian Football. 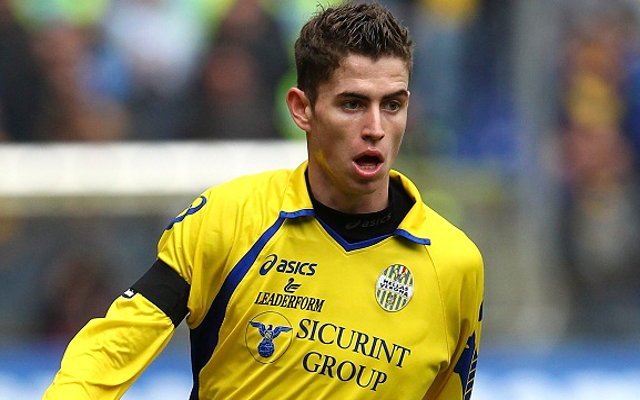 The arrival of Jorginho coincided with an upturn in fortunes and since 2011 Verona has secured two promotions, to return to Serie A for the first time since 2002. At 5ft 11 and a little on the lean side, Jorginho is not as physically well-built as a number of Premier League players, but has a strong technique and is a gifted ball player. He is rated very highly by the Italian media and almost joined AC Milan in the January transfer window, only for the Rossoneri to bulk at the asking price. The YouTube footage below provides a glimpse of his talents; let us know what you think using the Comments section below.